Over the last 13 years or so, we’ve learned a ton of useful things for dealing with canine epilepsy. One of the most important was learning how to keep our ever-stealthy yellow lab from eating food off the kitchen counters. Seizures can have many various causes, including abrupt changes in your dog’s diet. That’s why it’s important to keep his meals scheduled and routine. 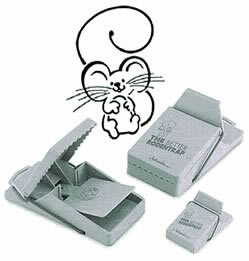 We tried many elaborate tricks and traps to keep him off the counters, but what finally worked for us was—-drumroll—Mouse traps. After Cory’s nose had its first meeting with one of these little snappers, Cory never went near them again. We would simply arrange them in an array around whatever food items we wanted to protect on the counter, and voila—Problem solved. The good news is that these things are really quite harmless. They don’t hurt at all, even if you deliberately snap your finger in them. They couldn’t harm a mouse, much less harm a dog. Plus, they provide great entertainment value to see the looks on your friends’ faces when they come over and see the kitchen armed with mousetraps everywhere, immediately assuming that your whole house must be infested. If you’re looking for a way to keep your epileptic dog away from harmful foods (or any dog, for that matter), look no further than these simple, handy, cheap little snappers. Have you found something that works even better? Do you have any stories of when your dog got something he wasn’t supposed to get? Tell us in the comments!